I went to coffee with some friends last week, and over our non-pumpkin-spice lattes, somehow the conversation at our table moved from parenting toddler, awesome restaurants, and last minute summer fun, to how there were only 4 months left in 2015. Specifically, what we had set out to do in 2015, that we hadn’t yet done. These ladies certainly aren’t shallow, and they’re tons of fun to hang out with, so I should have been less shocked about their lack of Roth IRA knowledge than I was. How could these educated women not know what a Roth IRA was? They managed their household’s finances, so it wasn’t as if they were completely clueless when it came to money, so I was shocked! As I drove home that afternoon I started wondering why that was. Did they not want to know? Did their husbands handle the investments portion of their finances? Or maybe, was it because understanding financial products, including Roth IRAs can be confusing and somewhat boring? 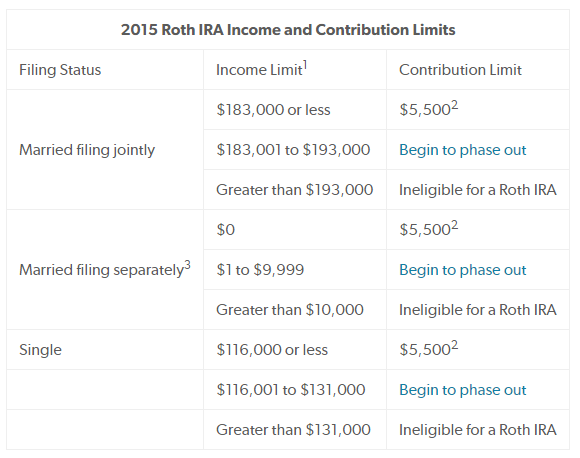 I’ll be honest, I never asked them why, but I believe that there was so little knowledge about Roth IRA contribution limits, rules, and even what a Roth IRA is because of the last reason that wen through my mind: They can be intimidating to understand. In high school, a representative from a financial services company (probably Edward Jones) came to one of our classes and showed us a chart like the one below. Almost everyone has seen a chart like this at some point, but like me during high school, brushed it off as not important. It wasn’t until later in life (22, actually) when I found out I was pregnant and completely irresponsible with money that I saw the chart again and it has a massive impact on me. The chart has a couple of columns, one showing a hard-working teen, and the other showing a person who waits to save until later in life. In this chart Ben is the early saver, and Arthur is the later saver. Ben starts saving $2,000 each year from the age of 19 until 26, or for 7 years. He does this working summer jobs in high school and college, plus a couple thousand each year for a couple of years after college. He only puts $14,000 in his Roth IRA – that’s it – and then stops. Arthur, however, starts saving $2,000 per year at age 27 and continues until he is 65. Why? Because his youthful self wants to buy shiny toys, cars, and new electronics instead of saving. In total, he contributes $76,000 over 38 years – $62,000 more than Ben, who started saving earlier. All told, assuming both Ben and Arthur’s investments have the same rate of return, Ben ends up with more than $800,000 more at age 65 than Arthur – who contributed $62,000 MORE than Ben every did! With any IRA, you are limited in the amount that you can contribute to it in any given calendar year. The 2018 IRA contribution limits in total for both types are $5,500 if you’re under 50 and $6,500 if you’re 50 or older. This amount is the total of both your Traditional IRA and Roth IRA contributions. The main difference between the Roth IRA and Traditional IRA is how contributions are taxed. A Traditional IRA will allow you to contribute up to $5,500 in 2018 and get a tax break. In other words, you will not pay taxes on up to $5,500 that you contribute to your traditional IRA until you pull it out, either in retirement or before. 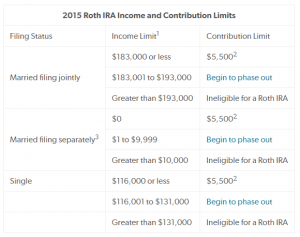 Contributions to a Roth IRA are made after taxes are paid. Even though you pay taxes on your contributions now, all of the growth on those contributions will grow tax-free. There will be no taxes required when you pull it out under the right circumstances. Because of the front-end tax breaks associated with Traditional IRA contributions, most people assume that you will save more money by contributing to it instead of a Roth IRA. Sorry, but that is wrong. Check out Betterment.com’s Roth IRA vs Traditional IRA Caulculator! A Roth IRA actually reduces your overall tax bill and lets you save more for retirement. Here’s the math: Let’s say that you are in a 25% tax bracket. This means that any contributions made with pre-tax dollars (to a traditional IRA) will save you 25%, and any contributions made after taxes will have cost you 25% in taxes. When you contribute $5,500 to a traditional IRA with pre-tax dollars, all you need to do is earn $5,500. No taxes are taken out of the amount, and that money goes straight into your IRA. However, when you withdraw that money you pay taxes on everything. Over the course of 40 years, contributing $5,500 per year, you will make contributions totaling $220,000, all made before taxes are paid. Over 40 years, assuming an 8% return, those IRA contributions will grow to $559,573.14. 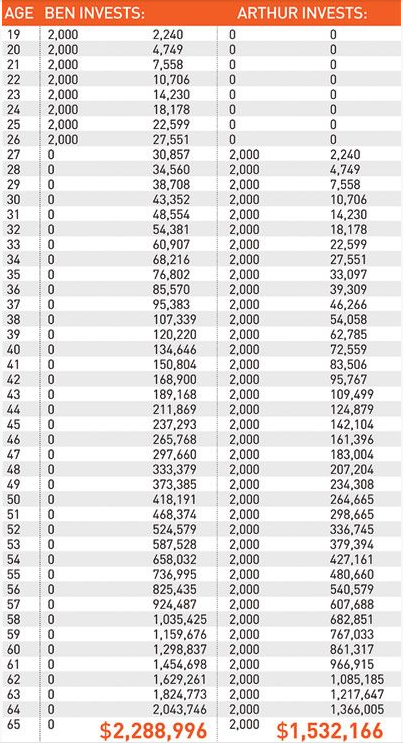 When you pull out your contributions, assuming a 25% tax bracket still, your tax bill will be $139,893.29 – one quarter of everything you have saved for retirement. By contrast, if you had paid 25% taxes on the money before you made contributions, your tax bill would have totaled $55,000 – and when the time came to withdraw your money, you would pay absolutely no taxes. Now, you cannot make after-tax contributions to a traditional IRA, but you can to a Roth IRA, and save yourself $90,000 in taxes. That’s $90,000 more you could save for retirement, or just for peach of mind because of one simple IRA tweak. You can save more for retirement by changing nothing except utilizing a Roth IRA for your retirement savings. In order to open a Roth IRA, you must have earned income, meaning you cannot open a Roth IRA for your child until he/she has a W-2 or 1099 issued to them for work they did. This is called earned income, and contributions must be made from your earned income. Most Americans qualify to contribute to a Roth IRA because of your income. The chart below lists these limitations. I recommend opening a Roth IRA with an online broker, such as Betterment, especially if you’re looking for a low-maintenance, easy to set up account. There is no reason to pay for a full-service broker when you’re making basic transactions and contributions. Plus, Betterment only requires a $100 opening deposit. Other alternatives include Motif Investing, Vanguard, ETrade, Scottrade, or TradeKing. These brokers have low fees, but require an opening deposit of $1,000 – $5,000. An IRA, whether traditional or Roth, is simply a holding account for your investments. Once your Roth IRA is open, you will have to choose how you want to invest your money. For most people, a simple stock market index fund or a target retirement date fund. Betterment allows you to choose which percentage you want to invest in stocks vs. bonds, and you can change that allocation once per day. The younger you are, the more of your money you should have invested in stocks. Stock market investments tend to be quite volatile, but the longer-term gains are greater than that of bonds. As you approach retirement age, you would want to allocate a larger percentage of your investments into bonds, which tend to have slower growth, but more reliable returns. I started contributing to my Roth IRA in 2013, and since then have earned 13.4% in returns, with 87% in stocks, and 13% in bonds. While those amazing returns are certainly no guaranteed, I know that my money won’t make those returns sitting in a savings account, CD, or money market account. Start Saving for Retirement now – There is no time like the present to start investing, like you saw in the chart above. Check if you income level makes you eligible for a Roth IRA, and if you are able to, open a Roth IRA there isn’t a better retirement account to open. What is your Roth vs Traditional IRA strategy? Share your thoughts in the comments! Sign up for The Centsible Home Newsletter – I would love to have you! What a great post. I started my Roth IRA many years ago and only contributed one time. Therefore it hasn’t grown much. A lot of the reason is because I didn’t fully understand it. I started it at my local bank. I’m going to have to figure out how to change allocations.